You will need a muffin tin with 12 cups. Divide the 12 squares of cookie dough and place one into each of the muffin tin cups. Bake the cookies in the muffin tin for 14-16 minutes, until lightly browned and cooked throughout. Let the cookies cool in the muffin tin for 10 minutes. Then, loosen from the edges with a butter knife and turn out onto a cooling rack. The center of the cookies will deflate as they cool. Finally, construct the cookie sundaes: Place one cookie cup on each plate. Top with a small scoop of ice cream (I use a cookie scoop, which is a little over 1 1/2 tablespoon of ice cream). 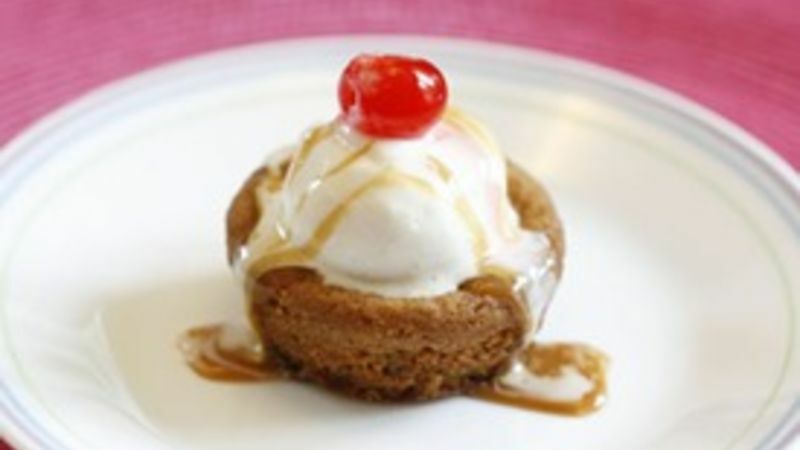 Drizzle the hot fudge or caramel sauce over each sundae. Then, top with a maraschino cherry and serve.